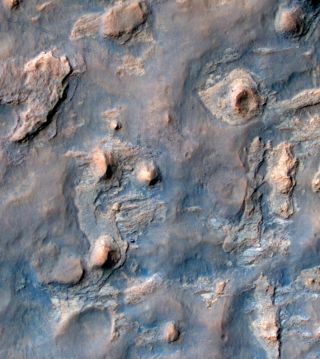 NASA's Curiosity Mars rover and tracks from its driving are visible in this view from orbit, acquired on April 11, 2014, by the High Resolution Imaging Science Experiment (HiRISE) camera on NASA's Mars Reconnaissance Orbiter. The rover is near the largest butte in the lower left quadrant of the image, at about a two o'clock position relative to the butte. It appears bright blue in the exaggerated color of this image. A spacecraft circling the Red Planet has spotted NASA's Mars rover Curiosity hard at work on the Martian surface. This image was captured April 11 by the High Resolution Imaging Science Experiment (HiRISE) camera on NASA's Mars Reconnaissance Orbiter. With faint tracks from its six metal wheels trailing behind, Curiosity appears as a bright blue speck in the two o'clock position relative to a large outcropping called "Mount Remarkable" in the lower left portion of the image. NASA's Curiosity Mars rover used its Navigation Camera (Navcam) to record this scene of a butte called "Mount Remarkable" and surrounding outcrops at a waypoint called "the Kimberley" inside Gale Crater. The butte stands about 16 feet (5 meters) high. Image added April 16, 2014. Curiosity is currently eyeing this 16-foot-tall (5 meters) butte as a possible candidate for further investigation, NASA officials said. If the rock formation looks interesting to scientists, the rover may use its robotic instruments to pull a dirt sample from the layer surrounding the base of Mount Remarkable. The rover touched down inside Mars' Gale Crater in August 2012, charged with the task of finding out whether Mars is, or ever was, suitable for life. Curiosity has already found evidence that Mars once had the right conditions to support ancient microbial life, through an analysis of dirt samples drilled at a Martian location called Yellowknife Bay, near the rover's landing site. Mount Remarkable is puny compared with Curiosity's ultimate science destination: Mount Sharp, a towering 3.4-mile-high (5.5 kilometers) Martian mountain. In the foothills of Mount Sharp, the rover is supposed look for a record of the Red Planet's changing environmental conditions, which could help scientists better understand how and why Mars transformed from a relatively warm and wet place billions of years ago to the cold, barren world it is today.